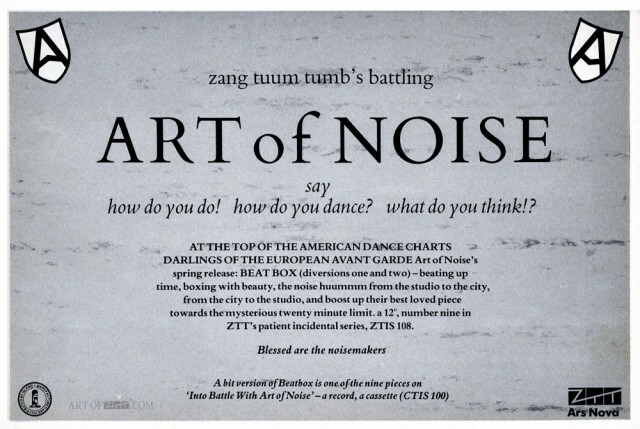 artist: Art Of Noise title: Beatbox format: The Face 1/2 pg advert design: XLZTT photography: n/a cat. no: ZTIS 108 date: 04/84 art of notes: Notice the ‘A’ masks don’t yet have faces, also the ‘into Battle’ cassette is mentioned. Starting with Two Tribes adverts, a Beat Box advert is missing. It says “blessed ART the NOISE makers for they shall disrupt the balance”. This is all I have Alfonso, there are some gaps, mainly with promo posters. If you know the magazine that the ad you mention is in it would be very helpful.